“Welcome to the Kentucky State Fair.” For anyone who has been coming to the best state fair in the country, you have heard me say these words. I deem it a privilege to have served as the official greeter of visitors to this wonderful event since 1958. Time sure has passed quickly and I have had the best seat in the house throughout those years to experience amazing exhibits, smell the wonderful food and to visit with the millions of people from across the state, throughout the country and even from around the world who have come to the fair. Many of you have been stopping by to say hello to me since I first arrived and I thank you for that. It’s always good to see old friends. But I get as much joy from meeting news friends, both young and those young at heart who stop to ask a question or two such as how tall I am or my shoe size. I think I have the best job in the world and I hope I have been memorable to all those I have met in the past six decades. Many things have changed over the years. I look a little different now than I did back in the late 1950’s. But we all change a bit with time, at least in the way we look. One thing that has remained the same however, is the reason I come to the fair every year. 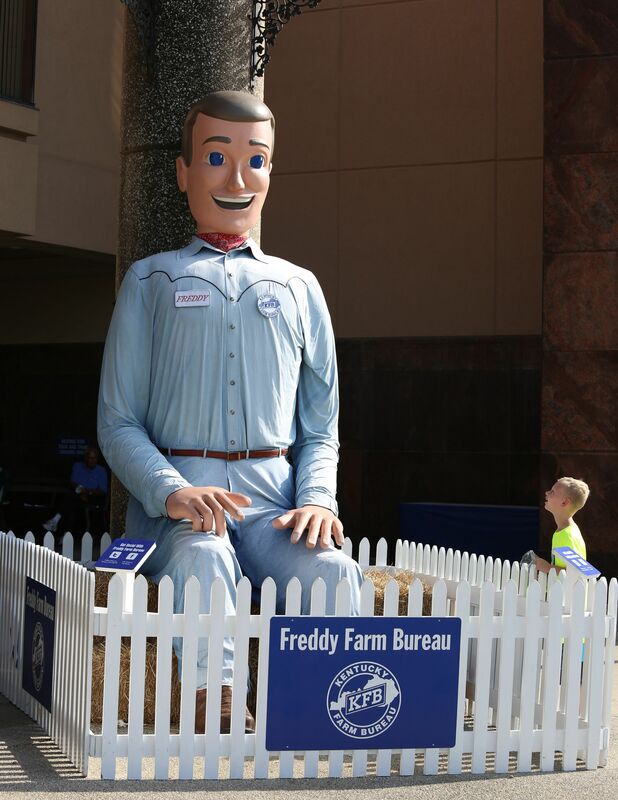 I am there to make everyone I see feel welcome and to provide a little information about the fair, Farm Bureau and agriculture to those who inquire. Many don’t know that the fair got its start, by some accounts, back in 1816 but wasn’t officially recognized by the state until 1902. Not long after that, Kentucky Farm Bureau was born and has been a close partner throughout those years. While I get a kick out of all the questions asked of me, I really enjoy talking about agriculture. It is one of the foundations of the fair and each year thousands of people come to show their animals, exhibit their crops or participate in ag-related events. Agriculture is as much of a tradition at the fair as I am and it is always a great experience to help so many people understand the importance it plays in our everyday lives. In the early years, most of my visitors had a connection to the farm but that has changed since then. But that’s okay. I’m happy to help remind people why we farm and point them in the direction of the many agricultural exhibits. While we all have experienced change since my first fair, some things remain the same. The Kentucky State Fair has always been a place to celebrate our heritage, our diversity and our love for this great state. This year will mark my 60th anniversary for attending this wonderful event and I am honored so many people have noticed, including our friends at Kentucky Living who featured me on this month’s Uniquely Kentucky page and the folks at the Kentucky Farm Bureau News who allowed me to provide their Comment Column for August. Nothing makes me happier than to share my story with the many friends I have made over the years. I hope you make your way to and enjoy this year’s fair and I look forward to seeing you there. By the way, I am 18 feet tall when I stand up and my shoes size is 31, in case you were wondering!